What is Runner's Relief Submersion Bath for horses? 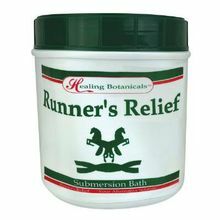 Runner's Relief is a submersion bath for horses that works great as a bowed tendon treatment and for many other ailments. Who is Runner's Relief for? How is Runner's Relief used? Horses run regularly to exercise and perform. Every veterinarian knows that injuries can be frequent and incredibly painful. 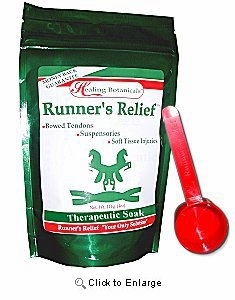 Runner’s Relief is a medicinal soak that provides intense heat therapy to any horse’s leg and foot injuries. Avoid invasive treatments with this natural soak. All Vet Supply always suggests organic solutions first, before the use of more potent medications or invasive surgeries. Try Runner’s Relief for sore feet, post-surgical comfort, stress relief and inflammation reduction - works especially well as a bowed tendon treatment. Do NOT mix with other products. Please read and follow all instructions on packaging. How does Runner's Relief work? Its natural botanical ingredients include herbal extracts to encourage increased blood flow through vessels and arteries. This improved and naturally boosted circulation allows for faster healing without dangerous side effects caused by synthetic products. 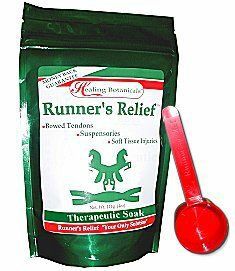 Not only does this soak help heal wounds within 90 days, but it relaxes your horse. Our Runner’s Relief treatment doubles as an equestrian spa-like experience. How much Runner's Relief do I get?